Slow Cooker Spicy Mac n’ Cheese is a super delicious, spicier version of the classic mac n’ cheese. This spicier version is made with the usual cast of characters; elbow macaroni, butter, eggs and evaporated milk but the list ends there. This spicier version is made with fiesta nacho cheese soup, taco-style shredded cheese and Mexican Velveeta cheese. A splash of hot sauce on the top before serving is optional but so worth it. For an added layer of flavor, we like to top our serving of slow cooker spicy mac n’ cheese with garlic-cheese flavored croutons. They added crunch provided by the croutons is a delicious and unexpected flavor boost. We like to top bowls of tomato soup with croutons also. After all, croutons aren’t just for topping a salad. Soups and stews benefit from the addition of croutons and we’ve even used crushed croutons as a breading for mushrooms. Speaking of crouton coated mushrooms, here’s the recipe. Beer Battered Crouton Coated Mushrooms. Slow Cooker Spicy Mac n' Cheese is a cheesy. spicy version of its classic cousin, mac n' cheese. Cook macaroni according to package directions; drain. Place in a 5-quart slow cooker. Stir in melted butter. In a large bowl combine the beaten egg, evaporated milk, milk, soup, cheeses, and ground mustard. Pour over macaroni; stir to combine. Cover and cook on low for 4 hours. Sprinkle with 1 cup shredded cheddar cheese. Cook 15 minutes longer or until cheese has just melted. 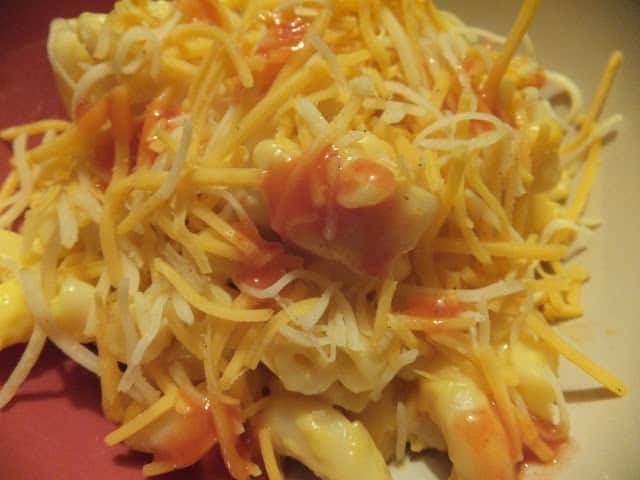 Sprinkle with hot sauce, extra cheese and croutons before serving. 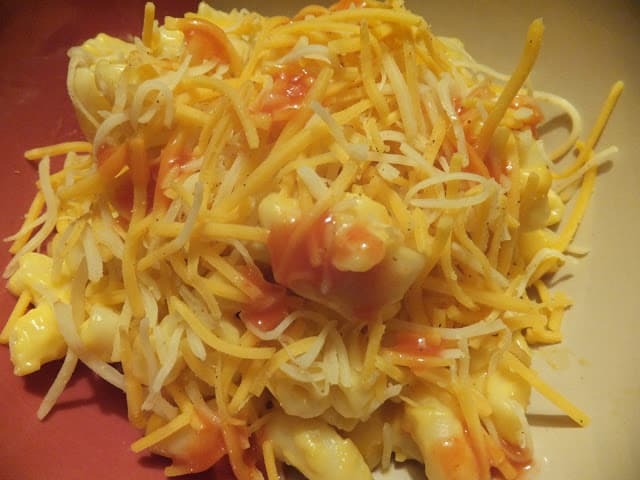 Before serving, sprinkle bowl of mac n' cheese with hot sauce, extra cheese and garlic-cheese croutons. Here is a very short ‘sample’ of recipes that we have to offer here at Turnips 2 Tangerines. Easy Cherry Turnovers with Pink Glaze, Apple Pie Slow Cooker Oatmeal and Beef Tenderloin Tips in Wine Sauce. We hope you take the time to look through our Recipe Box and try one of the over 1200 recipes we have. Slow Cooker Spicy Mac n’ Cheese was inspired from a dish I had at Noodles and Company called (what else) Wisconsin Mac & Cheese. G'day! 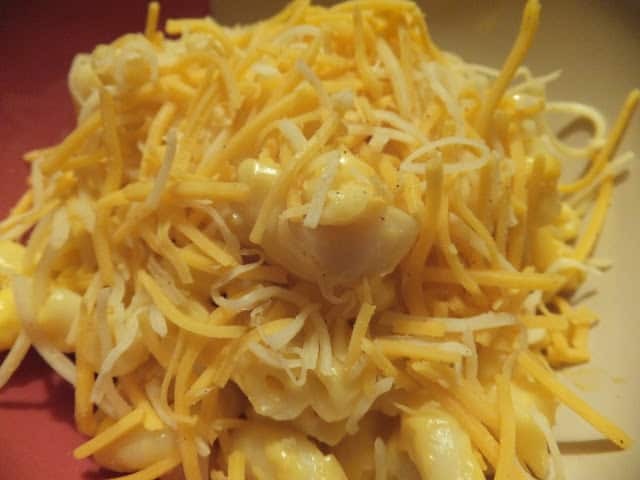 Nothing more comforting than Mac and cheese! Mac n' Cheese is a big favorite in this house. Loving the idea of making it in the crock pot! Thank you for sharing it at Wicked Good Wednesdays!